I stand in awe of the people out there in the world who can design and make�the real things that make the real world work, while the rest of us take it all for granted as we pursue other things. There is an entirely unjustified arrogance, I think, often found in those of us who have more purely�abstract work and interests, as if there were something lesser about building things�that make trains run. There is�surely some insecurity hiding behind that superiority - the insecurity of knowing eternal Shakespeare perhaps,�but not having a clue about magnetic detection of invisible flaws in rails - or even about how trains really work. Like me,�many of us would�be lost and helpless -�thrown back into the stone age -�if the everyday,�underpaid and underappreciated practical� geniuses disappeared. The Sperry Rail-flaw detector is�my case in point today. 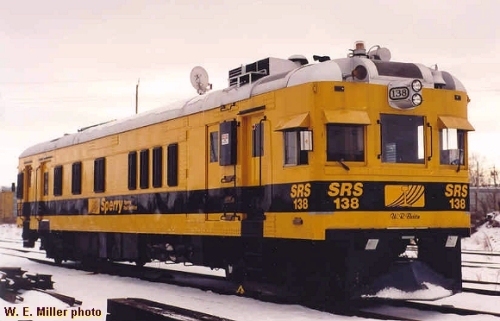 You could not run a safe railroad without these funky yellow�machines, which you can see around regularly,�perched on�sidings,�if you ride rails. Nowadays, they use ultrasound probes. Photo of an older�one below, and details of Dr. Elmer Sperry's remarkable career here.�As you can see,�his useful�company - one of 8 manufacturing�businesses he�created -�is still in business in good old�Danbury, CT, once the hat-manufacturing capital of the US (and the home of Charles Ives). Thanks, C., for the inspiration. I too am in awe of those who bring to life tangible works. In my younger years I was privileged to know Kelly Johnson who invented the P-80 Shooting Star, the U-2 , and the ultimate SR-71. I also had at Lawrence Livermore Labs the chance to be in on several briefings with Dr. Edward Teller, father of the hydrogen bomb. But I think you might be selling short the man who doesn't produce the tangible item but perhaps is the catalyst for the idea. As my example I give you two names ..LEONARDO DA VINCI and ARISTOTLE. da Vinci gave use many ideas he never worked to fruition and Aristotle discussed the "atom" as the building block of life.....so it's not always the man /woman who conceive and build, but sometimes it's simple the man/woman with an idea. Not meant to disparage idea guys. Just an appreciation of the makers, without whom I would be sitting by a campfire. But, you wanting more than a campfire is what creates the market for those scientists, engineers, & craftsmen. Those old Greek guys--they did it! Originally, the Greeks believed in Sophia (the wise hand). That wisdom was the work of both hand and mind. However, somewhere between Socrates and Aristotle the two were divided and thus we have those who think, and those who do--even today in our high tech world--we still seem to think that way. Although, the reality is that in order to do there must be a wisdom present! Not to disparage idea guys ( OK, I lie), but as someone who has spent most of his career having to (somewhat against my will) implement some of the bad ideas of "idea guys" let me tell you, it ain't very romantic. Keep in mind that Da Vinci (and I assume Aristotle) and most of the best "idea guys" first did practical work and became "idea guys" once they proved their ability to produce something tangible. It seems that today, too many people think that they can learn stuff in school and view it as a viable substitue for what the old fashioned "idea guys" used to learn the so-called hard way. Foamers love track geometry cars. Back on the railroad, we used to call rail fans "foamers" - for foaming at the mouth. Now they proudly call themselves foamers. I guess I'm a foamer, too. That's a dang nice office those guys have... with an ever changing view to boot... cool, Skook. Notice the upper right corner of the first photo. On the wall is a carved wooden plaque containing an old rifle and other objects that remain unidentifiable in the photo. Now, this is a pure guess on my part, but such a plaque may have come from some old passenger or business car - perhaps one also named "Rio Grande River." Modern railroading is a thoroughly unsentimental business, but once in a while the guys will sneak in something like this when they can. Those writers of the American Renaissance--Hawthorne, Emerson, Thoreau, Whitman, Melville--they wouldn't recognize America today. I wonder what they'd say. My Father was a Mechanical Engineer at Sperry Gyroscope in Great Neck L.I.. I still have his gold cufflinks. I never had heard about Dr. Sperry before. I think it was eventually bought out by Remington Rand or Univac (mainframe computers??) or went under when the Long Island Defense industry went under. Thanks for the post.